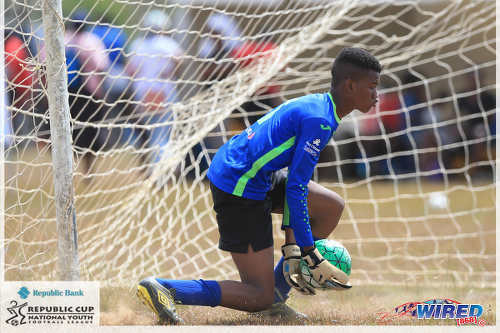 A few beaver tricks, a cheeky rabona kick and a hatttrick from a goalkeeper were among the highlights to savour as North Zone action in the Republic Bank Youth League (RBYL) continued apace at the Queen’s Park Savannah on Saturday 6 April. Queen’s Park Cricket Club (QPCC) and Pro Series maintained their early 100% records with contrasting wins in the Under-11 division, while RSSR and Trendsetter Hawks I maintained their own perfect records with convincing victories in the Under-15 division. 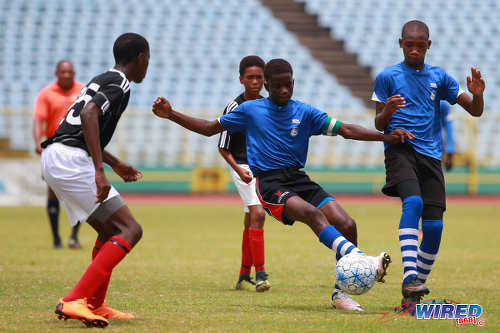 Photo: Pro Series’ Hashim Portillo (right) holds off a Football Factory opponent during RBNYL action at the Queen’s Park Savannah on 30 March 2019. The aspiring footballers braved the blistering heat, a couple heavy downpours and some gusty wind as they strutted their stuff on the ‘Savannah Grass’—or that should read ‘Savannah Dust’—on Saturday. This year, the RBYL welcomes sponsors such as Blue Waters, Gatorade, Holiday Snacks and Pizza Hut. 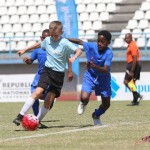 And each match day, the players will be vying for MVP awards courtesy Pizza Hut (Under-11, Under-15 and Under-17 divisions) and Blue Waters (Under-13 division). No matter the on-field or overhead conditions, these youngsters tend to serve up a treat and Saturday was no different; although some would’ve gone home in chirpier moods than others. 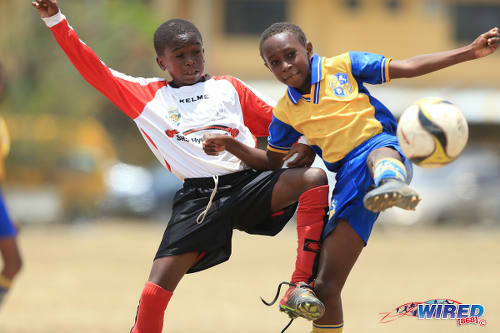 QPCC’s Under-11s for instance, fresh off of their 11-nil drubbing of Trendsetter Hawks II in Week One action, did not skip a beat as they stylishly played North Coast SCC off the park to emerge 8-1 victors on Saturday. North Coast’s Under-11 outfit regrouped to swat aside Excelente FA 6-nil in a later encounter, thanks to a beaver trick by Marvin Quintero; but they had no answer for a well-oiled QPCC in their first encounter on the day. Much has been written about QPCC’s organisation and cohesiveness at youth level on this platform, and their Under-11s lived up to the hype on Saturday with a slick display. Attacker Samuel Smyth was a thorn in North Coast’s side throughout the 50-minute encounter and helped himself to four goals—the pick of which came in the 10th minute when he carved through the opposing defence before calmly slotting away from close range. With much of their first team players believed to be playing under the North East Stars moniker in the Youth Pro League (YPL), QPCC could not replicate that form in the Under-13 division, as they were whipped 4-nil by Trendsetter II. It was quick revenge for the heavy defeat Trendsetter’s Under-11 compatriots suffered against the ‘Parkites’ a week earlier. 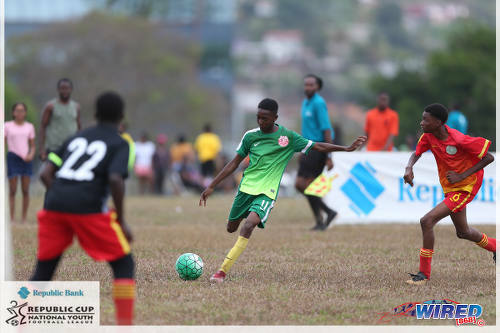 Photo: QPCC’s Samuel Smyth (right) passes the ball beyond Trendsetter Hawks’ Nasique George during RBYL action at the Queen’s Park Savannah on 30 March 2019. A second half Marcus Young double paced Trendsetter II’s success but it was Jamaal Jemmott—son of gifted former national midfielder Kerwin ‘Hardest’ Jemmott—who got the ball rolling with a dipping long range effort in only the fourth minute. Jemmott has some mighty shoes to fill but he did his job effectively enough with timely interceptions and shrewd playmaking from his deep defensive position. 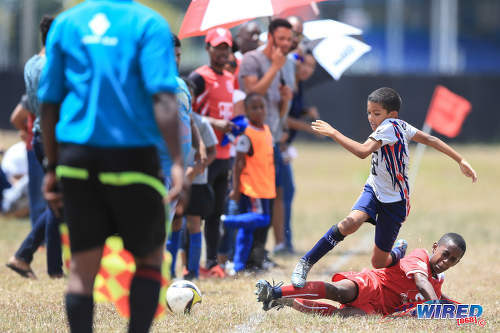 The battle of the Trendsetters may be an interesting one in the Under-13 division, as Trendsetter I brushed aside T&T Maestros 7-0, with Zion Harley grabbing a double. The Maestros, who are known for their own brand of attacking football, had a rough day at the office on Saturday. 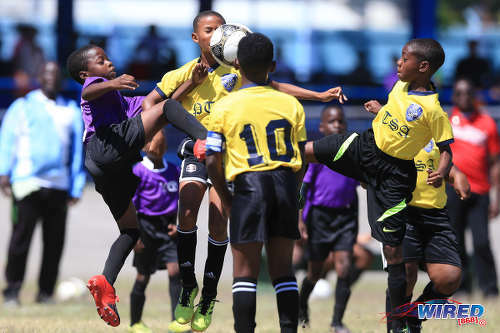 Apart from their heavy loss to Trendsetter in the Under-13 division, Maestros were wasteful and succumbed to a 2-nil defeat at the feet of Pro Series in the Under-11 division, while their Under-15s played to a 1-1 draw with St Mary’s College despite dominating the game. Coach Sheldon De Freitas and the Maestros supporters felt hard done by, as a controversial ‘drop ball’ decision by the referee led to a fortuitous equaliser for the ‘Saints’ in second half action. 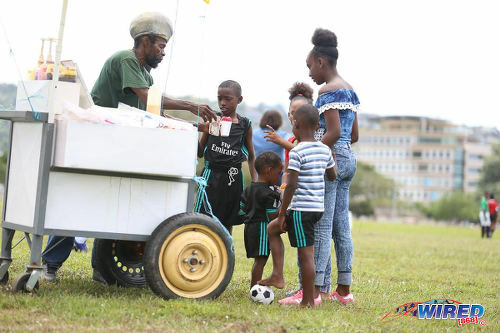 “Allyuh spoiling the football for the youths man!” De Freitas said, while some Maestros supporters accused the referee of favouring the striped outfit from Frederick Street. Photo: A North Coast player (centre) stops to get a snow cone during RBNYL North Zone action at the Queen’s Park Savannah on 24 March 2018. Maestros could have still won it all at the death, but J’Sean Batson—whose own goal put St Mary’s on level terms—saw his goal-bound stab dramatically cleared off the line by a ‘Saints’ defender in the 64th minute of the 70-minute encounter. 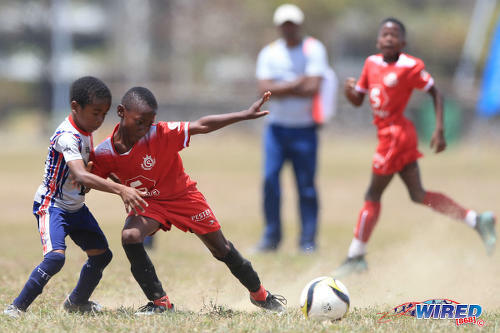 The stalemate between Maestros and St Mary’s was the only Under-15 match tailor-made for the neutral on Saturday, as RSSR spanked Trendsetter II 4-0, Trendsetter I mauled North Coast 6-0 and Santa Cruz United walked all over Laventille United in a 9-0 demolition. 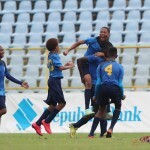 RSSR, fondly named after four former Trinidad and Tobago national standouts from ‘Behind the bridge’—Russell Tesheira, Sammy Llewellyn, Selris Figaro and Reynold George—are already showing their intent on recapturing the North Zone Under-15 title which they secured two years ago. 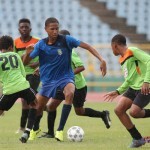 On that RSSR team, Mamade Guerra, the nephew of ‘Soca Warriors’ midfielder Ataullah Guerra, and Saeed Pompey Charles, a quarter-miler who represents Trinidad and Tobago at junior level, were the standout players. This year though, a new cream seems to be rising to the top, and it may include the RSSR goalkeeper. Shaquan Alexander, a lanky Form Two student, turned heads on Saturday as he scored a hat-trick of penalties to help down Trendsetter II. Remarkably, all of Alexander’s penalties were struck to his opposing number’s right, and RSSR coach Marlon Phillip ranked the strikes from ‘good, to better, to best’. Alexander’s feat even took some gloss away from teammate Zair Samuel, who scored an audacious second half free kick to put the contest beyond all doubt. Is it too early to compare young Shaquan to iconic Chilean goalkeeper José Luis Chilavert? “Shaquan is the most composed out of all the players,” Phillip said. “It just shows that the confidence and the development is there. “We started training the team from last year with the goal of capturing the title again in the Under-15 division and we have had two good results thus far. We want the development to be holistic and we don’t want the players to be jumping from place to place. Trendsetter II may have been an easy hurdle for Phillip and RSSR to overcome on Saturday, but Trendsetter I, led by former national midfielder Travis Mulraine, should be a different preposition altogether. Trendsetter I copped their second straight 6-0 triumph this weekend, following up on their rude spanking of their Trendsetter II counterparts in Week One action. Christon Calder was the main man on the day, netting a pair of goals. However, midfielder Renard Frederick was the showstopper, as he scored from just inside the box with an absolutely scrumptious rabona kick following a cross from the left flank in the tenth minute. Photo: Trendsetter Hawks I’s Renard Frederick (centre) prepares to cross against Hawks II during RBYL action at the Queen’s Park Savannah on 30 March 2019. Now that’s flair for you! 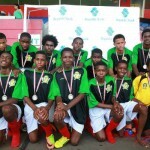 Trendsetter won the National Under-12 and Under-16 divisions last year, however, they could only manage a quarterfinal finish in the Under-14 category, effectively the same group Mulraine has brought to contest for Under-15 glory this season. Not one to back down, Mulraine wants his boys to be standing tall on the podium when it’s all said and done. “The aim is to maintain the two titles that we won and cop the title at the Under-15 level as well,” Mulraine said. “This is the third year I’ve been coaching the Under-15 team. Hopefully, we would go two steps further because last year we reached the quarterfinal and this year we really want to win the title outright. Mulraine noted that QPCC—who were on a bye on Saturday—would be a threat to their title aspirations. However, the once all-action player may have to keep an eye out for Christian Browne too, as the youngster scored four of Santa Cruz’s nine goals in their thumping win over Laventille. But the RBYL action is only just getting started, and De Freitas, Mulraine, Phillip and scores of parents and supporters will have much more anxiety coming their way, as the youngsters battle the elements in a quest for glory. Photo: Break time! 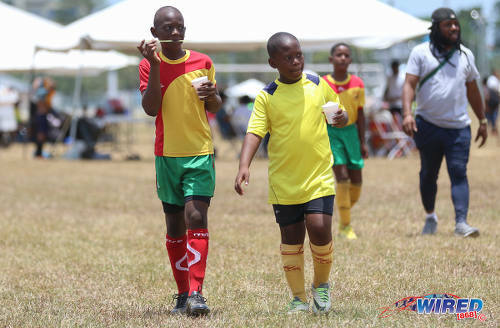 Two Trendsetter Hawks players from different under-11 teams stop for a sno cone on the opening day of RBNYL North Zone action at the Queen’s Park Savannah on 22 April 2017. 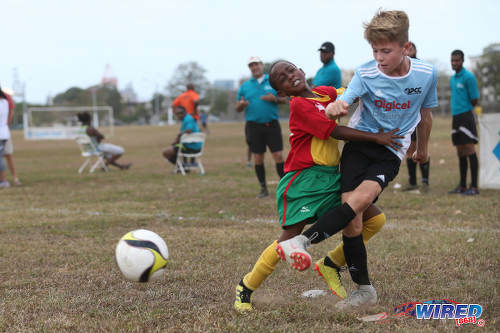 Photo: Football Factory’s Pierce Dalton-Brown (top) is tackled by Pro Series’ Jasai Theophilus during RBYL action at the Queen’s Park Savannah on 30 March 2019. 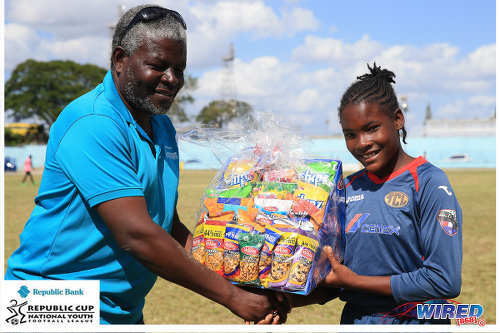 Photo: Mayo Youths’ Azelia Mills collects her Holiday Snacks prize for the South Zone U-13 MVP of the Round from administrator Gerald Elliot during RBYL action on 7 April 2019. 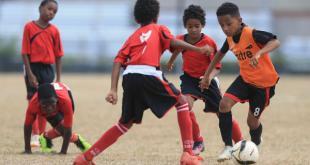 Photo: Jaric Titans captain Orlando James (centre) tries to create room for himself against Trincity Nationals during the RBNYL U-14 finals at the Hasely Crawford Stadium on 7 July 2018. There are around 40 games per weekend. We are never going to get all the necessary information on them without some assistance from external parties. So thank you for your assistance. Video is expensive to do properly. But hopefully before the season is out Mango! Lasana Liburd I hear you meh brother. @Roneil Walcott Maestros U15 coach and supporters had an issue with a drop ball situation? St Mary’s had possession, when the referee was alerted to a fallen Maestros player Raphael Lackraj (himself a CIC student). He blew his whistle, the Maestros physio ran on the field, treated Raphael and left. Correct decision by referee: a drop ball from where play was stopped. Ball won on the drop by Jace Callender of CIC who passed to Cody Doyle-Syriac, who in turn passed to Jeillon Jackman on the left. Jackman cut in and shot at the far post. With the ball head for the post Batson jumped to head clear and got a bad deflection an d the ball went in. It wasn’t even an own goal. Sorry that Maestros felt bad about the outcome but you can’t look down on other teams there must be due respect for all opponents. I cannot dispute your take on the series of events as I didn’t see the exact moment when the ref did the ‘drop ball’. However, the Maestros personnel would have a totally different perspective as they were incensed when the goal was scored. As stated in the article, they were accusing the ref of ‘siding’ with St Mary’s and they also felt that many free kick decisions did not go their way.